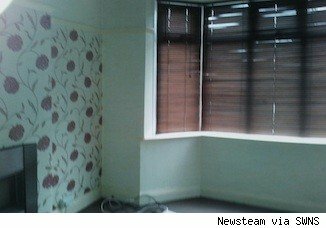 Most unhappy couples might prefer that their divorce dramas play out privately in their own homes. 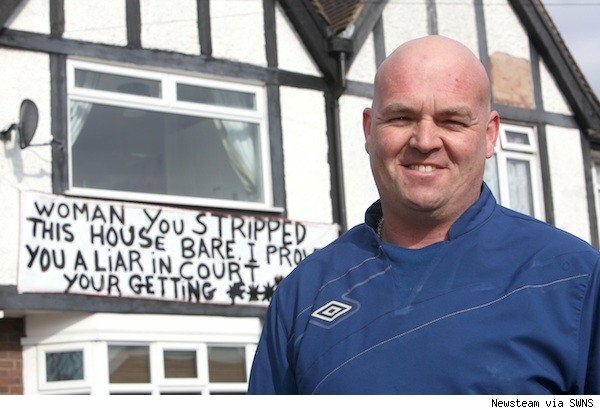 This man had a different idea: He's taking the battle with his wife public and letting the drama play out on his home. With a 6-foot-by-4-foot sign blasting his wife affixed to the front of his house, now the whole neighborhood knows Robin and Jeanette Baker's business. If you thought foreclosure signs were bad for home sales, wait until you get a load of this Brighton, Colo., homeowner's spray-painted disclaimer. 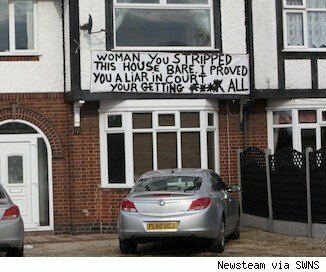 "I thought I would put this sign up to show her that she wasn't getting anything," Robin told the Daily Mail. "I did it to get the message out that she won't walk all over me." The couple is currently fighting over their $193,000 house. Robin said his wife is seeking half of the equity in the house, "but I'd sooner get it repossessed than her have some of it. ... It's our house but I paid the mortgage and paid everything. I wanted to prove to other [men] that they don't have to let their ex walk all over them." Robin said he's gotten a positive response to the sign, with people driving by and honking in support and even one man who knocked on his door just to shake his hand. Neighbors seem to find it amusing: One woman who lives in the neighborhood told the Daily Mail, "It's one way of putting his point across, I suppose. I think he's a little bit upset. I've never seen anything like it before. I think he wants to get his message across in a big way. It is quite eye-catching." Jeanette Baker has not responded publicly to her husband's claims and makeshift sign. Robin's in good company: A woman from Oregon attracted national attention last year when she posted a sign in front of her home advertising her husband's philandering ways and their divorce. Elle Zober of Beaverton, Ore., was trying to sell her home with a for-sale sign that read: "Husband left us for a 22-year-old ... House For Sale by scorned, slightly bitter, newly single owner." Jessica Simpson's Parents Having Trouble Offloading Home in Divorce?